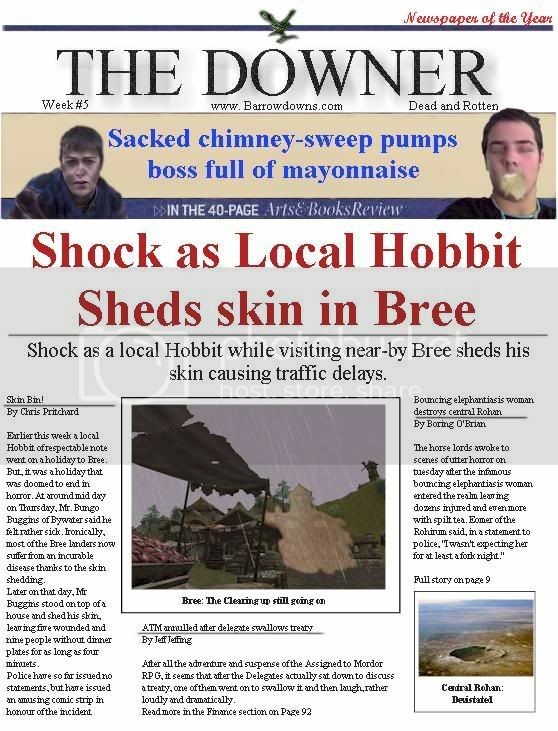 Read all about it, Extra! Local Wight rises from the dead! Time space continuum found dead in shop window! 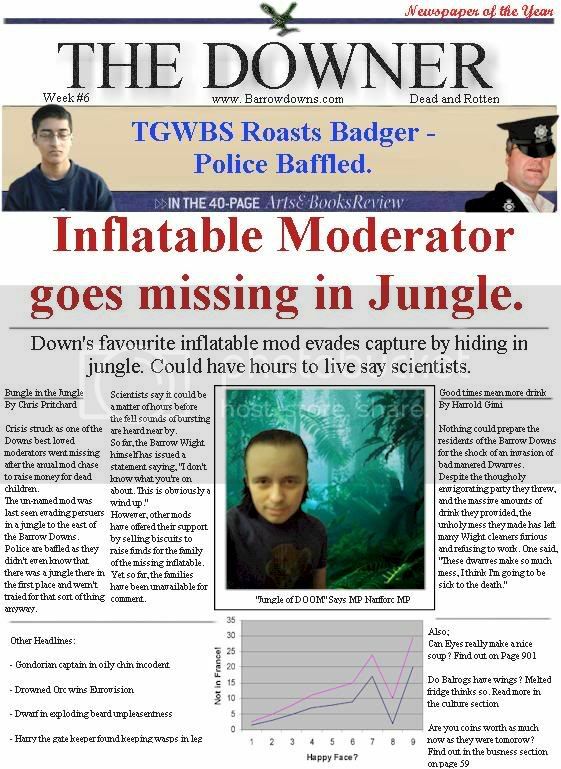 Idiot makes fake newspaper! 2) Now everyone can join in on the fun! Here is the plan... I'll post the weekly front page and anyone can post an inside story of their choice. It can be any section of a Newspaper; Politics, current affairs, sport, literature; you could even make some puzzles if you want! Just post your story here! Remember, this is Mirth, so make it funny, or you'll be cast out! (Note: Only the front page will be posted as a picture, the others can be normal post unless you really want to include pictures). Oh, and you can write under a pseudonym if you wish. Also, if you wish to write a front page story, contact me by PM with your proposal. If it passes my 'funny' test, then I'll put it on the next front page! I'll be updating every Monday... hopefuly. Here's one for an inside page. The new hit series "Middle Earth Idol" has lately come to a rolling stop. The contestants have song their songs, but the judges are nowhere to be found!? It has been heard that Vala Seacrest has lately taken on the role of moderating another fun game "Werewolf". Our dearly beloved (and always seemingly drunk because she's always too happy) Wilwa Abdul has been missing in action for almost a month. Has she gone to a rehab? Or is she off trying to find a new husband? One of the co-creators of this hit series, Glirdy Jackson, has been heard to have gone on vacation because his brain is on the fritz. The final judge who we all love to hate, Sleepy Cowell, has not been seen around for quite some time. Will this hit new series continue? Or will it turn into a flop like the "The Middle Earth Americain Football Tournament"? Only time, and perhaps a bit of extra cash, will tell. Note: Any questions about what I have put in here, please feel free to ask me...through PM's of course. Last edited by Glirdan; 07-05-2006 at 11:19 AM. The infamous 'Mount Zoom Challenge' came under scrutiny today after a press conference by the creator, a Mr. H Goomba, said, "If the players won't play, then we'll have to close it down." There was a lot of confusion going on with players dropping in and out, posts being very short and a general lack of interest. A Pit stop was called to give the players a chance to recuperate, finish exams and other such annoyances. However, with the end of the Pit stop, last Saturday, so far none of the players have progressed the game. If the latest challenge is unattended, then the game will be abandoned. Sauron was quoted in an interview, saying, "I'm furious, obviously. My Mountain of Doom is far superior to the others and I need to prove it to all of Middle Earth!" So far, none of the players have been available for comment. Last edited by Hookbill the Goomba; 07-16-2006 at 03:48 PM. 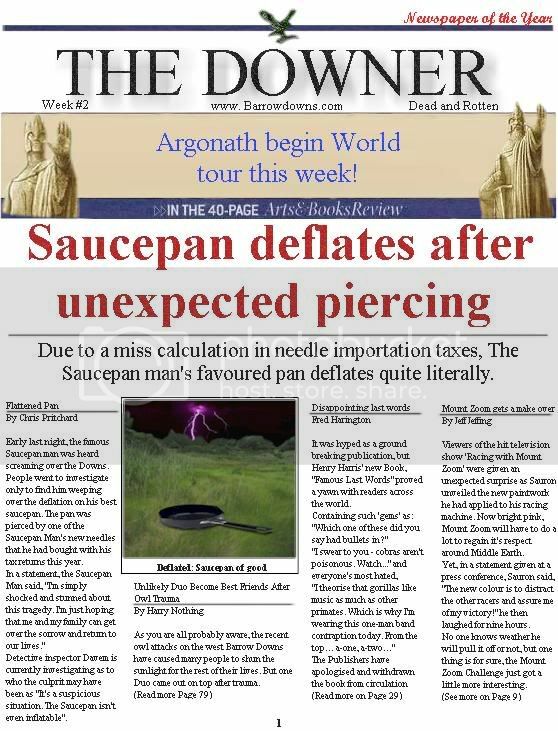 Two of the members from a new Shire RPG, Dimutriel and Witch_Queen, have been missing for awhile. If anyone has spotted these two members or has any information about them, please notify the creator of the "Days of Darkness" RPG, Crystal Heart, as soon as possible. There is a reward of a million cookies being rewarded to anybody with information on these two missing members. You are allowed to berate them in anyway (ie. hit them, yell at them, hit them, force feed them cookies and hit them [make sure it's not to hard though. We still need them to post for their charcters after all]). Please notify the authoriy ASAP and thank you for your ghostly support in this matter. 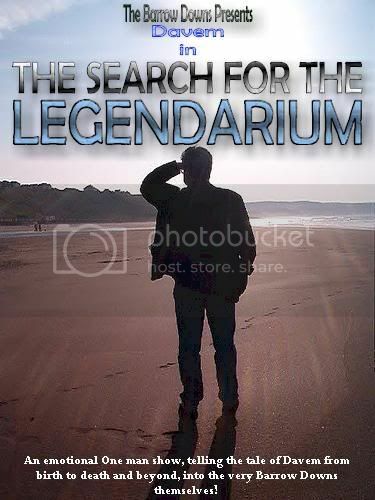 Today saw the opening of the infamous Davem's one-man show, "In search of the Legendarium". This emotional journey will bring even the most hardened Wight to tears and will probably change your entire life. The acting is outstanding, the music is unforgettable and the props will literally throw you out of your seats! If you're in town this week, I highly recommend this! If that's not your thing, also opening this week is Gil-Gallad's version of Superman, showing at the alternative theatre. However, don't expect any of the action of special effects of the latest films, no. This play includes Gil running around with the cape over his head, speaking muffled lines and performing odd fight scenes. The other actors are fine, the music is good and the lighting is admirable, if he'd take the cape off his head, it would probably be a good show. The only big film on the horizon is Hookbill the Goomba's documentary film "Crazy Captions: The Movie" to be re-named 'Crazy Captions: Beneath the cloak' in Gondor. Here, the Goomba looks into the success of the thread and asks the questions everyone wishes he hadn’t. Last edited by Hookbill the Goomba; 07-09-2006 at 01:20 PM. I was not a frying pan, but actually a kettle. And, rather than being completely deflated, it lost a small amount of air before the puncture was happily repaired. There is a lesson to be learned here, however. Inflatable kitchenwear is a false economy. 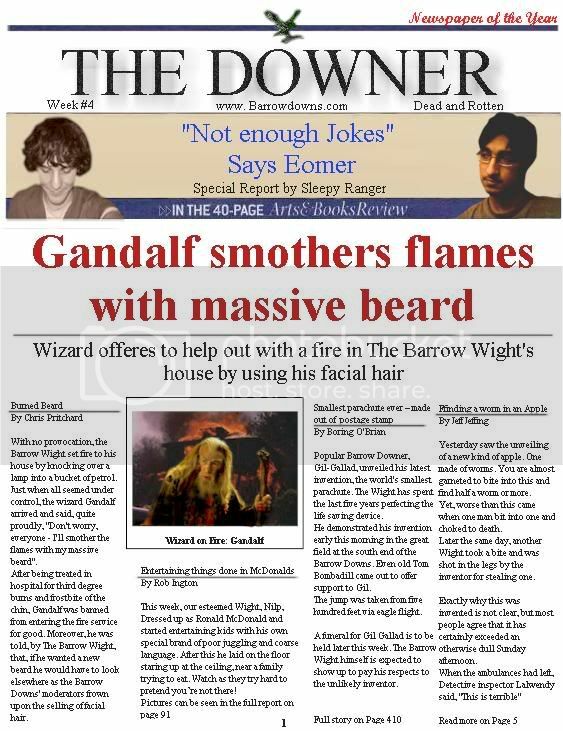 Well, after considering your comments, the Downer newspaper has decided to offer an official apology and give you two tickets to see the Argonath's world tour, beginning tomorrow in Berlin. After a long night of Crazy Captioning, a local Wight was today buried under a Dog avalanche outside the Dead Inn in the north of the Barrow Downs. Police are still investigating the incident and refusing to allow the dogs to be removed due to a fear of losing evidence. 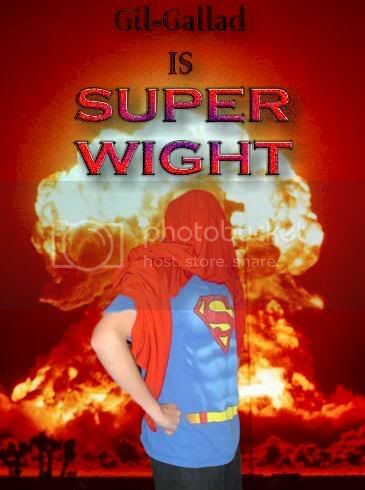 The Wight in question later suffocated. Fact X Importance = NEWS! Here are this weeks Football / soccer results. The Barrow Downs minister for education announced this week that dead children are to be banned from schools. A survey showed that dead children don't do enough work and distract the other children due to teasing and smells. Head teachers have welcomed the scheme saying that it will reduce classroom sizes and also leave the canteen freer to living people. Barrow Wights have called the decision 'disgraceful', 'horrible', 'shocking', and 'disgraceful'. 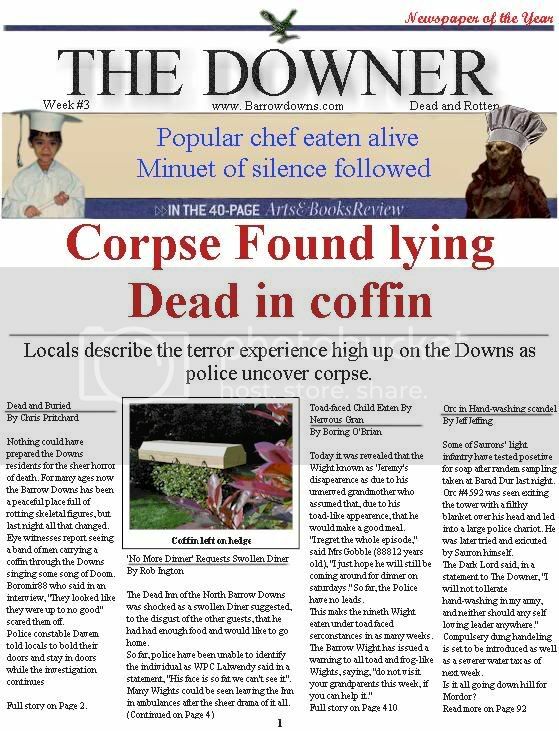 As with all self-respecting newspapers, The Downer has it's own small comic strip. This one is called 'The Phantom and Alien'. This is the News... Happy now? And so the weeks continue. [QUOTE=Hookbill the Goomba]Today saw the opening of the infamous Davem's one-man show, "In search of the Legendarium". This emotional journey will bring even the most hardened Wight to tears and will probably change your entire life. The acting is outstanding, the music is unforgettable and the props will literally throw you out of your seats! Or else Davem is just looking for Lalwende who had snuck off to the cinema with Boro ..is this the first item for the "Downer" gossip column? Possible, though not plausible. But hay, this is the newspaper world we're talking about, go wild! The Phantom and Alien... Episode Two! This hit new series has finally gotten off it's back and onto it's feet...well...sort of. It was heard that Glirdy Jackson, one of the co-creators, was heard complaining to the other judges about communication. In an interview, Glirdy had this to say: "We have no communication with each other. Only Cowell and Seacrest seem to know what the challenge is for the next week without consulting the other judges. Yes I know that Cowell is technically the creator and that Seacrest is the host, but Wilwa and myself should still get a vote, should we not?" Will the judges and host eventually come to an agreement? Or will it be a flop? Only time, and a really good detective, will tell. I see I got promoted between weeks three and four too. Wouldn't it be a scary world if I was a police officer? Anyway, I think Mithalwen has unwittingly demonstrated her suitability to be the 3am 'gossip' Girl. 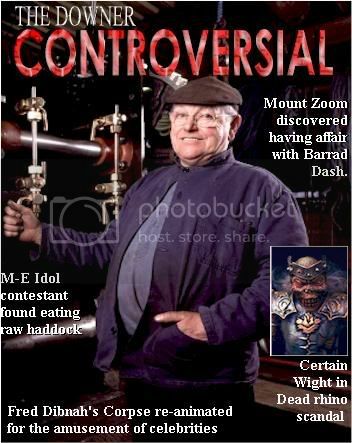 We were able to catch up with this weeks eviction from Middle-Earth Idol, Hookbill the Goomba. Gary - Hookbill. Mr. Goomba!! Could we talk to you for a second? G - Do you think we could have an interview? H - No I wouldn't like to do an interview. G - Well, I thought you did a fantastic job in the Middle-Earth Idol Competition. You were really one of my favorites. What I'd like to know from you is what you thought of the judges? H - I thought the judges were very slow on the uptake. I mean, come on! I should have been off at the first hurdle! I not only fell over at that hurdle, i set it on fire and then used the ashes to poison several high-ranking officials. What more do I have to do? G - And what of the show itself? Did you have fun? H - The show itself was... interesting. I felt the production values were, putting it lately, awful. The sets were cardboard and I am pretty sure the cameraman was not only blind, but also often facing in the wrong direction. G - What are your thoughts on the other contestants? H - As for the other contestants... I think that The Saucepan man was the best. He brings his own instruments. G - Now that you're done on Middle-Earth Idol, what do you plan on doing next? H - I plan to go back to my career in journalism and race management. That seems to get me the reputation points that keep me in cheese and ham. G - It was a pleasure talking to you and thank you for your time. The joke is that you and Davem will be continuously changing rank throughout the weeks. Watch out for next weeks edition where CID Lalwendë discovers a man made of cheese. Will he be a WPC too? Anything is posible with The Downer. Can you spot all the LOTR things? That's all I could see. You mean you don't read the Mirror with your morning coffee? Hmm, maybe The 'Downer is an altogether more high-brow read anyway. It's better than Metro anyway. Not afraid to deal with uncloaked wizards? Crazy Captions Inc. is seeking Humour Representatives to sell funnies to bring amusement to the dullest days of Downers across the world. Hours to suit. Commission paid for every new joke made. Basic £5.50 p.h. OTE £20,000. 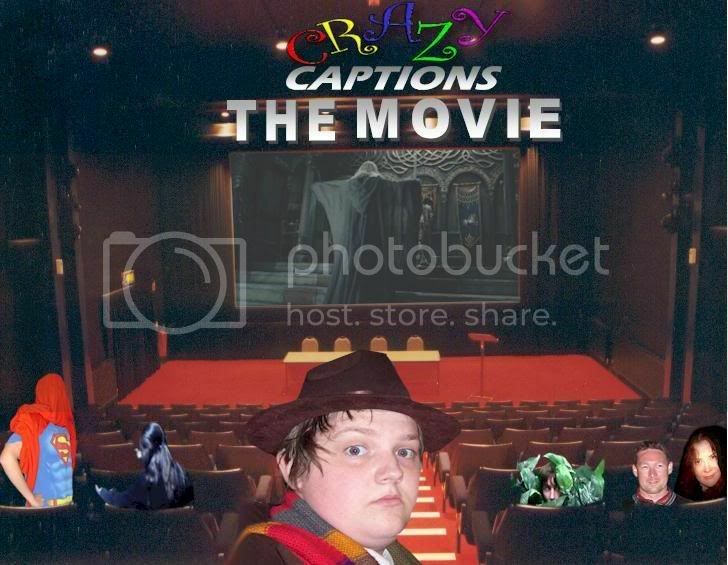 "Crazy Captions Inc. is the best employer ever. I would fully recommend working here." - Hookbill, Head of Captions. Gil-Galad: We have here today one Johnny the Stinky Balrog, now mr.balrog, how did you come by this name? GG: terrible, so now you wander around Middle-Earth *looks at paper* helping strangers with their problems and rasing a Penguin army. GG: oh really? how does a Balrog sail? JB:by not telling the crew theres a Balrog onboard! ha ha ha! JB:hey can you get some special effect guy to make a picture of that? GG: we can try, but now Johnny, about this latest thing, where you burned down a local make-up store because of being turned down by a lady, do you care to explain? GG:indeed...do you have any plans for the future? GG: excuse me? did you just say lovely spam? GG:woah... now did you just eat that spider? GG: you just ate that spider! GG: i swear i just saw you eat that spider! GG: your the one rambling! you ate that spider! JB:i did not... wait... didn't you get killed off or something? JB: hey yeah you did get killed off! After report: i never heard from him again, he was an interesting fellow and i would love to do more interviews of certain downers if one Goomba that may or may not have a bill that may or may not be hooked allows me to. Tune into more of my awesomeness and a PM may be coming to you soon! The Red Planet Approaches Earth!! Yes, that's right people! Mars is coming to Earth. Within the month of August Mars will get ever closer to Earth; finally being seen by the naked eye on the night of August 27th, 2006. This will NOT happen again for another 60,000 years...so grab your friends and family and be a witness to this awesome spectacle. I want to thank you for doing such an excellent job on this publication. I enjoy all aspects of it and the £1.20 price tag is incredibly modest. Thank you for your letter regarding The Downer. You will receive a packet of floss. I think the £1.20 price tag is very good value! 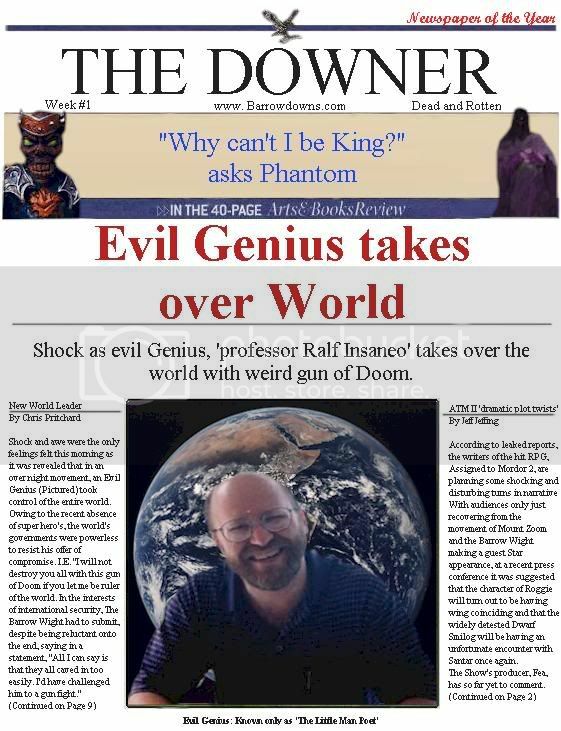 No other 1,000 page newspaper can boast as much as The Downer. Thank you for you comments. You will receive two balls of glue. I think the price of £1.20 is far too low! I would gladly sell my house and all my possessions to help The Downer. Thank you for your input. You get a table made of cheese. But the letters weren’t all full of praise. I think The Downer is a load of old dwarf droppings! I think you're a load of old Dwarf Droppings. [QUOTE=Lalwendë]You mean you don't read the Mirror with your morning coffee? Good grief no, much more a case of the Telegraph with my evening gin & tonic ...unless it is Saturday in which case it might be coffee ..... don't generally imbibe before tiffin Also I live in the sticks ... we don't get Metro, instead local life is supported by the delightfully anachronistic Lymington Times. It's News... but not as you know it! And so we move on to week 5! i told you i found that Rhino in my basement! You know how the media always over blows these things. Oh, lest I forget. The latest adventures of The Phantom and Alien. Last edited by Hookbill the Goomba; 08-13-2006 at 11:09 AM. The hit series Survivor has lately come to a stop. What happened to the All Star Survivor that was supposed to happen? I was able to catch up with all of the previous hosts (with the exception of Anguirel who seemed to be sick with something called the Mublewumps) to get their thoughts. Well, Mr. Reporter, I think it's game fatigue- too many games going on! 2005 was definitely the year of the Game, and the 2005-06 School Year was as well, but I think that game fatigue is catching up to the 'Downs in general. It's also my considered opinion that a lack of a Moderator has meant a lot of problems. Either the Board Commitee is being too picky in selecting its new Moderator, or else the lack of candidates is appalling. What is needed is someone willing to step forward and bite the bullet. If someone were to do that, we'd have a good game going, I think. Probably a smaller one- not like the heady days of the original, Boromir88 Survivor, but fun and well worth it. The unique thing about Survivor is that it requires pretty no commitment or brains from anybody- except the Moderator. However, without a Moderator, I fear this series shall be lost to history. Um, well, don't ask me these kinds of questions, I don't know what's going around here half the time. "Here" meaning the world in general. Tonight I couldn't decide whether a person with the first and middle names of Alex Lawrence was a boy or a girl. However, I'm sure that if All Star Survivor ever actually happens Chrysophylax could beat Smaug because Smaug is stupid. Well, perhaps it's just a slump. There has been game after game after game. I think that people are just wanting to take break from all the insanity of running and playing in a game. Having modded two Werewolf games and the Hobbit Survivor, I know exactly how they feel. I also feel that the RPG's and other forums seem to be getting more attention as of late. Perhaps it's just that all the Mirthy threads are starting to loose their appeal? The lack of a Moderator quite frightens me. Is the Comittee Board on strike? Or is that the candidates are absolutely horrendous? I have no idea. But I would really like to see this All Star Game happen. After all, it was my original idea. Please note that all interviews are not made up by me. They are word for word interviews with these moderators. Will this final chapter in the Survivor series happen? Or will Glirdan's dream be a complete wash out? If you're interested in Moderating this All Star game, pleas let any of the previous moderators know and they'll set up an interview. As ELO once said... "Here is the News"
The return of everyone's favourite comedy double act! Davem looks like he has a role in "The Full Monty"
Ah, classic I say, a classic.